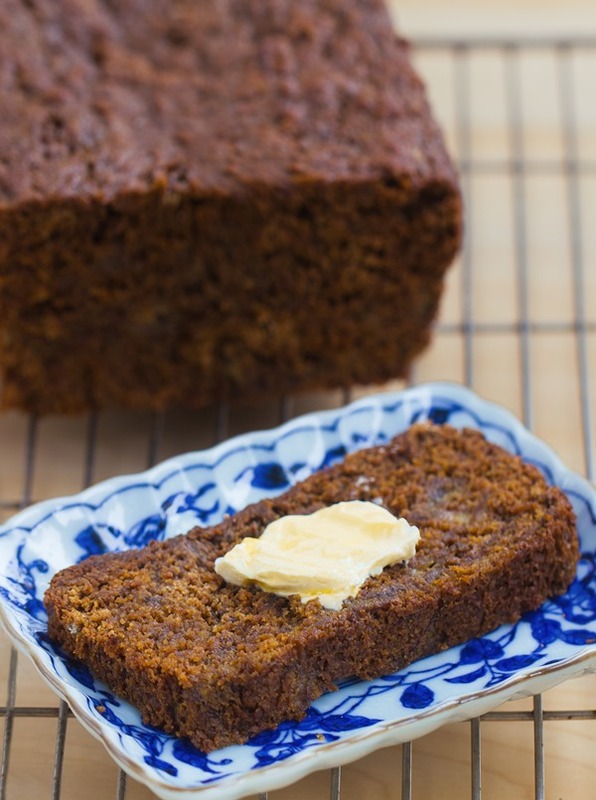 Gingerbread Banana Bread – Soft and moist gingerbread combines with sweet homemade banana bread for the ultimate holiday baked good. Maple Syrup And Agave – Are They Better For You Than Sugar? Pretty much on a weekly basis, readers ask me what I think of agave, maple syrup, and other alternatives to white sugar. Should you replace white sugar with maple syrup? 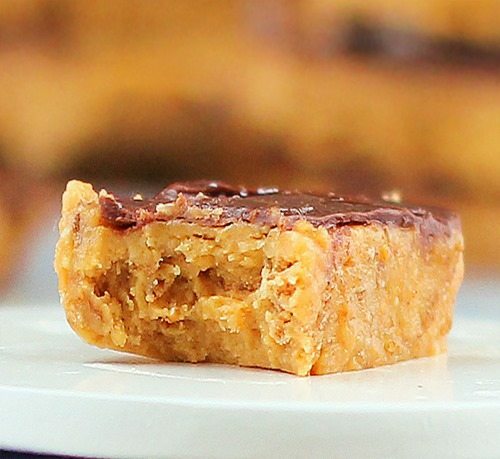 Side Note: Here is a link to Over 100 Sugar-Free Recipes. While these sweeteners might be a little less unhealthy than table sugar, that doesn’t mean they are good for you. Sugar is still sugar, and it’s a good idea to cut back no matter what type of sugar you are using, whether it’s maple syrup, agave, honey, coconut sugar, brown sugar, or white table sugar. I keep this in mind when developing recipes, and most or all of the recipes on my site that call for any type of sugar will have significantly less sugar than traditional versions of the same recipes. There is, however, one exception: blackstrap molasses. Blackstrap molasses is by far my favorite sweetener, not just for its gingerbread flavor but also because it offers an incredible number of health benefits packed into one tiny tablespoon, including copper, manganese, magnesium, potassium, and 20% of the RDA for both calcium and iron. If you’re new to molasses, be sure to try my recipe for Vegan Pecan Pie. Especially around Christmastime, I try to add molasses to as many recipes as I can. 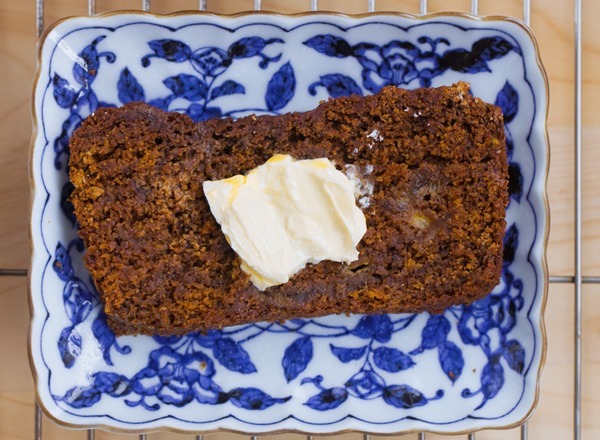 And since I’ve already done regular gingerbread, with my 3 Secret Ingredient Gingerbread Recipe, making banana bread seemed like the logical next step. 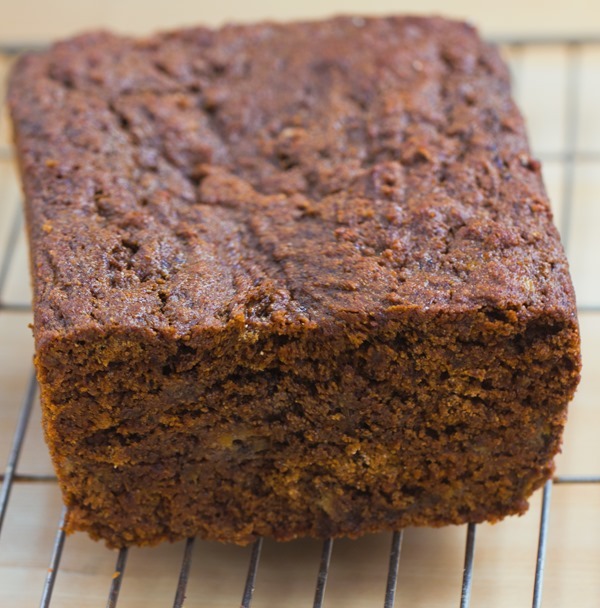 If you like gingerbread and bananas, you will love this vegan gingerbread banana bread! « Chocolate Sugar Cookies – NO Flour! Hi Katie, I’d love to make this (sounds delicious!!) but I’m a little concerned about the baking time. My oven tends to run cold, I think, because I almost always bake things about 5 minutes longer than the recommended time. Is there a reason why you shouldn’t open the oven to test the bread at the 33-minute mark? Or in my case, would you recommend just baking the bread for 38 minutes and then turning the oven off? Thanks! I think it would be much better to risk undercooking than overcooking, so I’d probably recommend doing 35 or 36 minutes and then turning the oven off for ten. Then if it’s still undercooked, you can always turn the oven back on and bake longer. 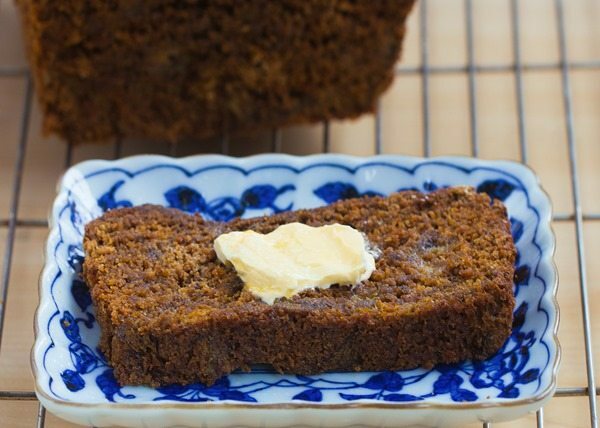 Oh I would like it for breakfast so much.. gingerbread is one of my favorite things! I’ve only tried the ones I list in the recipes, so unfortunately I can’t vouch for any others. But sometimes commenters will leave feedback in the comment section about variations they’ve tried. Personally, I have had good success in many recipes with both Bob’s gf all purpose mix or Arrowhead Mills gf all purpose mix. I usually don’t even need to add xanthan gum. 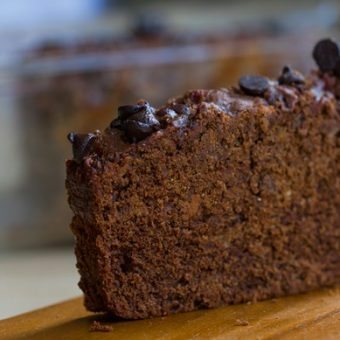 The combo of gingerbread and banana bread sounds amazing 🙂 Need to try this! Love this!! 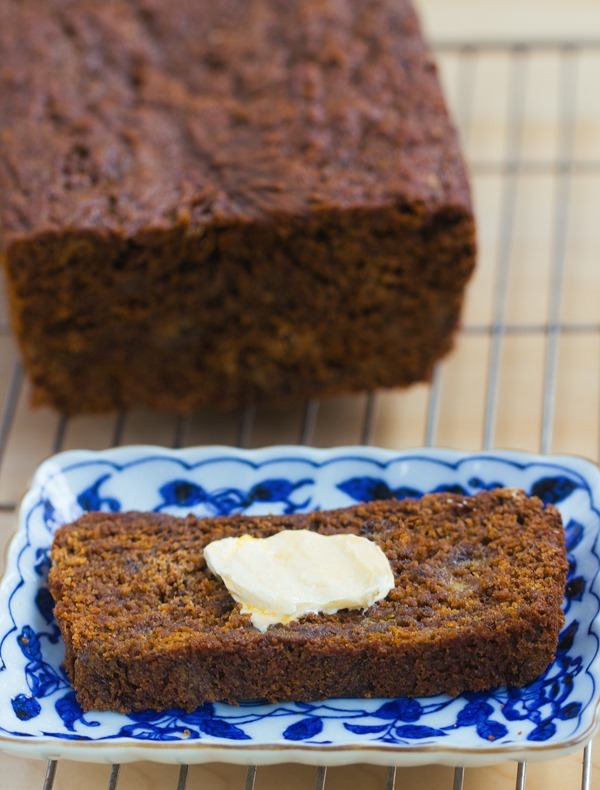 Winter is my favorite time of year because of all the gingerbread <3 Gingerbread banana bread?? Hell yeah! just pulled this out of the oven! My home smelled so good with this in the oven. I followed your directions exactly, even turning off the oven & letting it sit- that was hard for me to do because I’ve never done that before- I was scared of the results, but it was PERFECT! I used a bundt pan, added 1/4C raisins, used whole wheat pastry flour & Greek yogurt instead of milk because I ran out. My nine yr old and I made this tonight and it was a big success! My two little boys, daughter, and I really enjoyed it, thank you. I love that it is gluten free as well! Thanks so much for shedding some light on the sweetener debate! It’s really frustrating sometimes, trying to find the best possible solution. I agree that even if maple syrup and agave have x times more of some minerals, it’s still a teeny tiny amount compared to molasses or fruit. 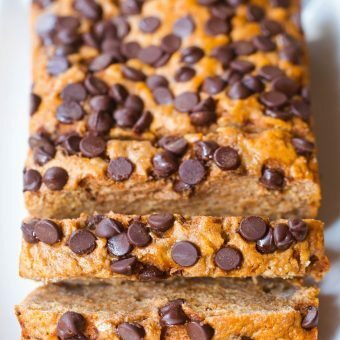 I love how healthy and low sugar all of your recipes are! 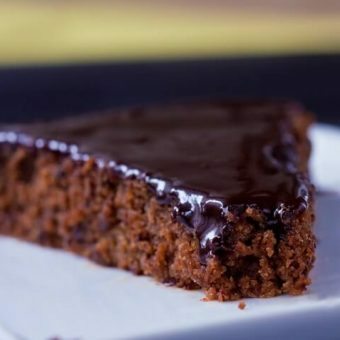 You’ve been my greatest dessert inspiration 🙂 I personally prefer erythritol and stevia at the moment and I’ve been neglecting molasses, which I love so much. Thanks for reminding me how amazing it is! I’ve always stayed clear of molasses, because I really didn’t know how to use it right. But you’ve convinced me! I’m going to have to grab some and try this recipe! Just enjoyed this for breakfast. Delicious. I love the addition of the black strap molasses. So good. Can you use apple cider vinegar or is it white vinegar? I can’t recommend anything I haven’t tried, but you are always free to experiment! In general, baked goods with whole wheat flour tend to be more dense, but some people don’t mind that. As a personal preference, it’s not my favorite flour to bake with. I prefer spelt (also whole-grain). 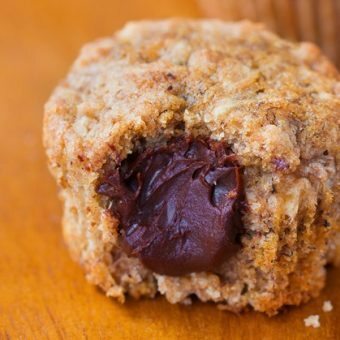 Unfortunately I do not… you can use oat flour if you want it to be “flourless” but I haven’t tried it with a paleo flour such as almond or coconut and am thinking it would probably need something to bind. But maybe the banana would be enough of a binder. If you do try one of these flours, definitely let me know how it goes! I used oat flour and it tastes delicious! Anyone in altitude states? And have baked this? I am horrible at converting. I unfortunately have little baking experience in high altitudes, but if I see anyone reporting back I will definitely reply with more information here! I’ve not tried so I really can’t say for sure; but when I add spices to recipes, I will add a little and then taste the batter. This one will be hard to mess up, so maybe start with replacing the cloves and nutmeg with 1/2 tsp of the pumpkin spice. Then go from there. I can’t wait to try this for myself – it looks so delicious! If you experiment, definitely be sure to report back! And yes, if I were doing the experiment I would definitely use a smaller pan and shorter baking time. Good luck! Your pictures are so pretty and appetizing that I feel hungry now. I have prepared gingerbread many times with pleasant results. I am surely trying out your recipe this coming weekend. Just wondering, why do you include a star rating in your comment when you haven’t made it yet? Good point – I always wonder that too! This is So delicious! Only changes I made were to use 1.5 cups whole wheat flour + 1/2 cup oats, and I made 12 muffins instead of a loaf (350° for 17 minutes). I’m in love with this recipe!! Did you leave the muffins in the oven , with the heat off (as in the directions for the loaf)? If so, how long? Seconding this! After all the things I’ve read about agave and experienced first hand, I’m still shocked to see it included in ‘healthy’ recipes. Each to their own, but please Katie, do more research on agave yourself and see if you still feel like recommending it as a healthy alternative. agave is NOT a healthy choice!